We left South Dakota and entered Pipestone, MN, a place where the sacred red pipestone is found for the Indian peace pipes. 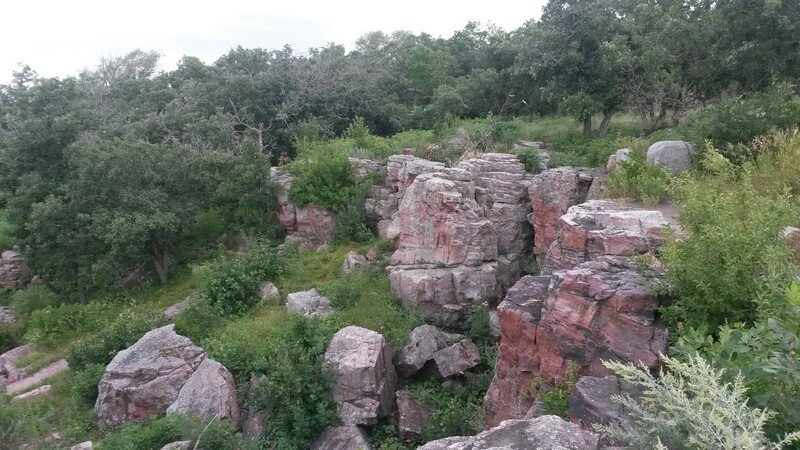 The soft pipestone rock is found just under the Sioux quartzite (the second hardest stone), so it’s no easy task getting to it. Seemed strange that it’s considered sacred ground and Native Americans need to apply for a permit to quarry the stone for their ceremonial pipes, but that anyone can buy a pipestone pipe now for $40. I passed. After our hike, we then stopped in a diner in Pipestone and obviously picked the local favorite. It was packed. Pam had stuffed hash browns (hash browns filled with cheese, onions, etc) and eggs, and I had a chicken philly sandwich that contained an entire chicken with a tower of fries on the plate. We left in blissful agony and did not need to eat for the rest of the day. If that was just one of three meals for the local folks then they must be loading up for the winter. It was nice having the Roamer and its bathroom because that strong of coffee has a serious impact on bodily functions in about 1/2 of an hour when you’re in the middle of nowhere. 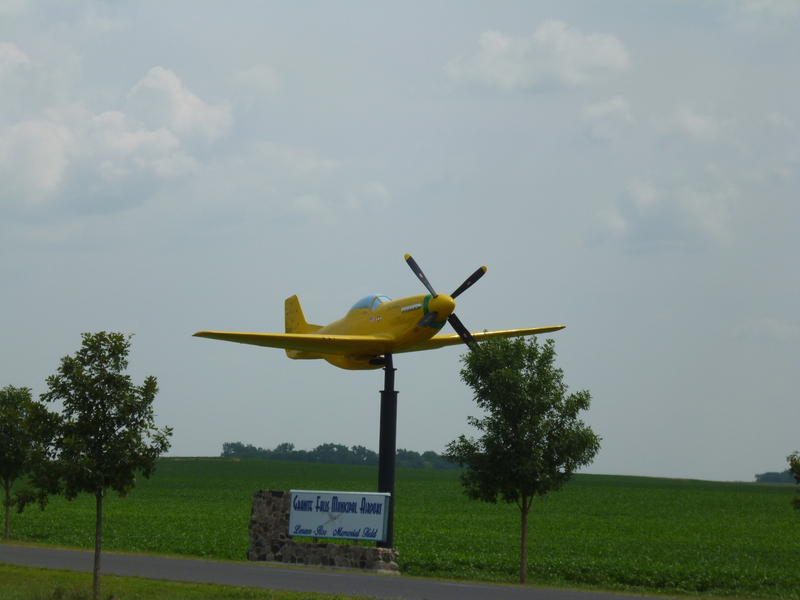 We then spotted a full size P-51 on a stick in the middle of corn country – had to stop. 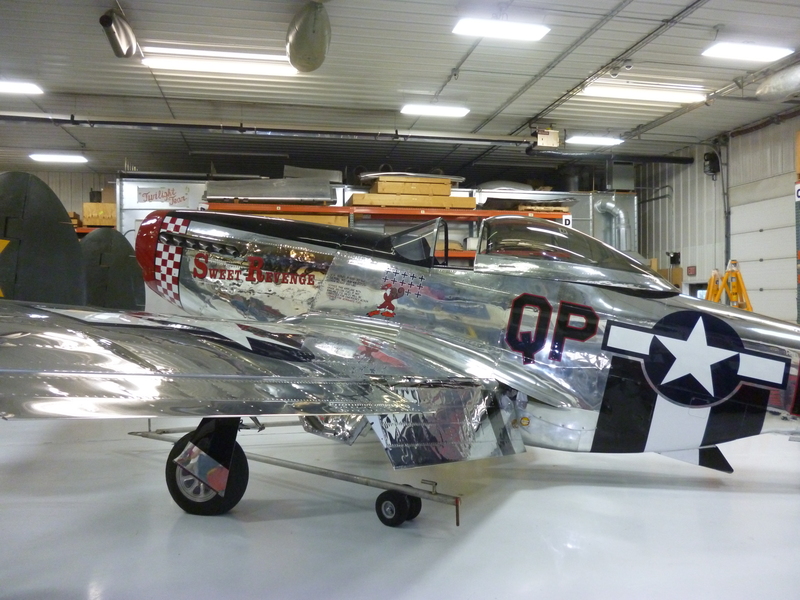 It was the home of the Fagen Restoration facility, where they put back to flight WWII aircraft. He had a P-38 that had just come back from Oshkosh as well as racing P-51s. Met another couple there that winters in Mesa. We crossed the Mississippi River in St Cloud, MN to make us officially in the east. I should have stopped in for a hockey shirt but passed as we went by the college. We camped in Taylors Falls, MN for the night, right on the St Croix River and the Wisconsin border. 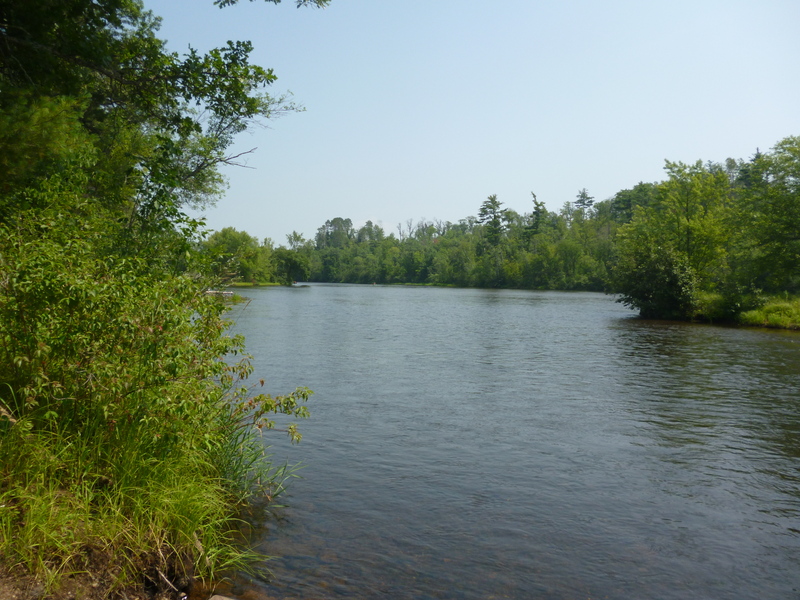 We came up the river area today and this looks like a future trip – canoe down the St Croix and camp along the river at the many campsites set up for just that purpose. The river was moving pretty good so it didn’t seem like a very tough adventure. A little paddling with lots of fishing and relaxing. The tough part would be to find a canoe big enough to hold the Roamer. 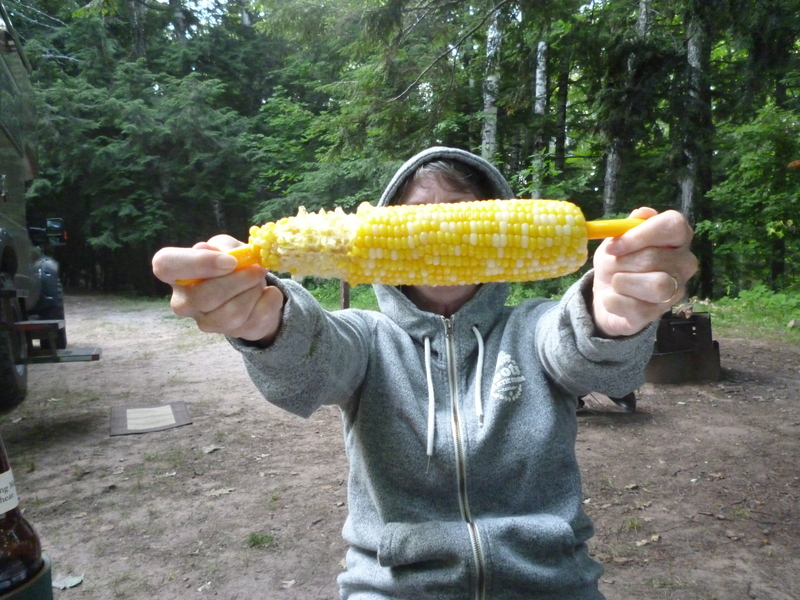 Sweet Corn is just now showing up along the roads – yes. Had to stop and grabbed a few ears. Dinner tonight was pork chops and corn. Fresh corn taste so different. Saved two more ears for tomorrow night. Camped on the banks of Lake Superior tonight near the Apostle Island National Lakeshore. 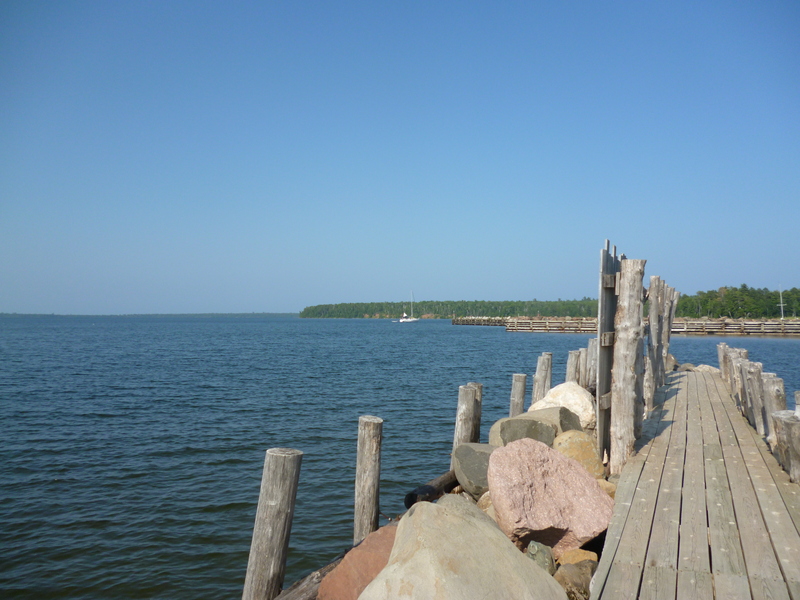 We will be heading up to the Upper Peninsula tomorrow and may take a rest day. You know you are traveling a lot when you have left-overs for lunch that you cooked several hundred miles ago. Pam and I have now been on the road for a month. Wow, time flies even when you are retired.